Yasmani Grandal inked a one-year deal with the Brewers. 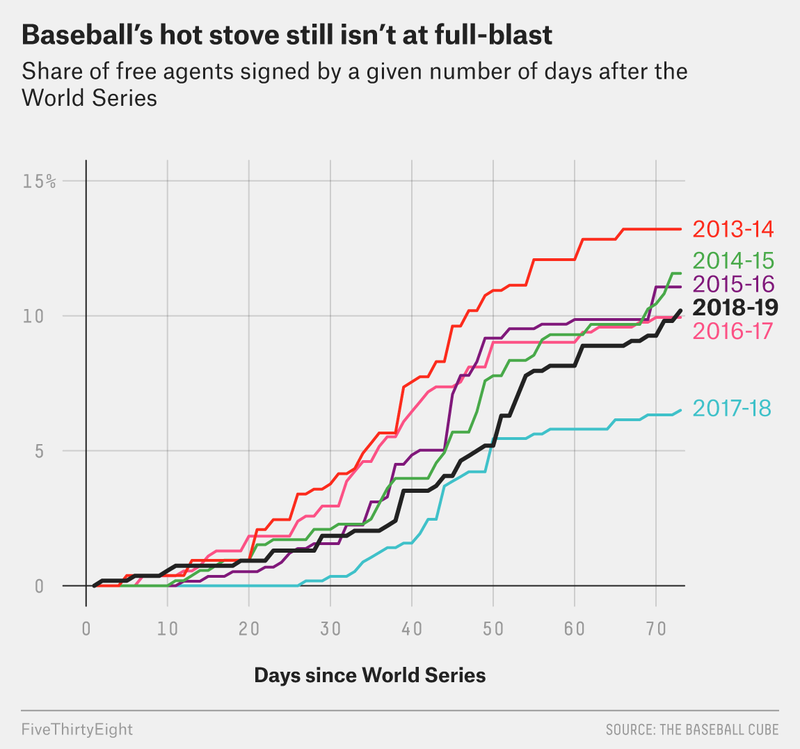 The Milwaukee Brewers took advantage of an ice-cold hot-stove season last winter to become the rare team to win in the offseason and in the regular season. By agreeing Wednesday night with free-agent catcher Yasmani Grandal on a one-year, $18.25 million deal, the Brewers again took advantage of an opportunity to find tremendous value. As most teams zig in another slow offseason, the Brewers, again, zag. While Grandal didn’t have a great postseason with the Dodgers last fall, he was one of the best players available on the free-agent market. According to the Baseball Prospectus version of wins above replacement, which includes a catcher’s pitch-framing ability, Grandal was the 14th most valuable position player in baseball last season (5.0 WAR) and the eighth most valuable player per plate appearance (5.8 WAR per 600 plate appearances) among qualified hitters. That was not a fluke. In terms of total value, Grandal was the No. 1 position player by WAR per plate appearance in 2016 (8.7 WAR per 600 plate appearances), and he ranked seventh in 2017. Over the past four seasons, he was worth 21.2 total WAR. That’s star-level production. He turned 30 in November, so he’s not ancient in baseball terms. But despite all this going for him, Grandal settled for a one-year deal. The switch-hitter offers rare power and patience at the catcher position. Over the past four seasons, his walk rate of 12.8 percent ranks 19th among all MLB batters. His .453 slugging mark ranks third among all qualified catchers, and his 116 weighted runs created plus, a measure of offensive ability that adjusts for park and run-scoring environments,1 trails only Gary Sanchez and Buster Posey. Not only is Grandal’s offense rare at his position, but his ability to frame pitches — to get more borderline pitches called favorably — gives him tremendous value at the plate and behind it. Grandal led all catchers in framing runs last season (15.7 runs saved above average). He ranked fourth in 2017 and second in 2016. Even as catchers as a group have improved their ability to receive or frame pitches, raising the floor of the skill, Grandal has maintained his edge. By runs saved, framing is more valuable than blocking balls in the dirt, an area in which Grandal is not as adept. Consider the following visual evidence of Grandal’s magic behind the plate last season. As a Clayton Kershaw slider darted slightly outside the strike zone, Grandal’s glove moved it back to within the confines of the zone. A pitch that should have been called a ball then appeared to be a strike. Grandal managed to softly absorb this high-and-away Kershaw fastball and make it appear to finish as a strike. It’s a subtle but valuable skill. Grandal was attached to a qualifying offer, meaning that the team signing him would have to surrender draft-pick compensation. As a revenue-sharing recipient, the Brewers will surrender their third-highest pick in the draft. The qualifying offer slightly diminished Grandal’s value, but qualifying offers are far from the only — and far from the greatest — issue conspiring against free agents. Even after last winter’s lack of free-agent activity, Grandal likely expected that he would be able to do much better than the deal he got. He not only turned down the Los Angeles Dodgers’ qualifying offer earlier in the offseason, but he also reportedly rejected a four-year, $60 million offer from the New York Mets. Instead, Grandal becomes the latest free agent to receive far fewer dollars and years than he had initially sought. The average salary in baseball declined last year for just the fourth time in the past 50 years and the first time since 2004, according to the Associated Press. Through Wednesday, the 73rd day of this offseason, 10.2 percent of available free agents2 had signed for a total of $856.2 million, according to a FiveThirtyEight analysis of data from The Baseball Cube. While that’s an improvement over the same point of last offseason, when only 6.5 percent of free agents had signed for $550.5 million, the total dollars spent to date are still down from 2016-17 ($1.017 billion through Day 73), 2015-16 ($1.697 billion), 2014-15 ($1.308 billion) and 2013-14 ($1.452 billion). As the free agency landscape changes, some teams seem to be looking for openings to give them an edge. Grandal has been the Brewers’ only guaranteed free-agent signing so far,3 but it’s a significant addition in their quest to repeat as National League Central champs. They have also reportedly agreed to a split deal with pitcher Jake Petricka, meaning that the contract would depend on whether he makes the big-league club.